Prince William was born on June 21, 1982 at St Mary�s Hospital in London, and christened William Arthur Philip Louis Windsor Mountbatten. Whilst his parents, Prince Charles and the late Princess Diana, were brought up in completely different ways, both aspired to bring him up in a normal fashion, given his heritage. Despite that, he has known all too well the almost constant presence and pressure of bodyguards and photographers. After the death of his mother, who was the most photographed woman in the world for many years, the media did relent in their pursuit of him. Nevertheless he attended Mrs. Mynor�s Nursery School when he was a young toddler, and once he reached the schoolboy age of about 8, he was sent to Ludgrove, a boarding school where he spent five years between 1990-1995. It was during this time that his parents separated. He excelled in sports as a youngster and as a teenager participating and doing particularly well in soccer, basketball, swimming, hockey, and rugby. His athleticism continued at Eton, from where he recently completed his schooling, having spent the years 1995 � 2000 at this rather famous and elite college. He was popular amongst his classmates and it has to be said is fancied by a huge proportion of the female population from around the globe. 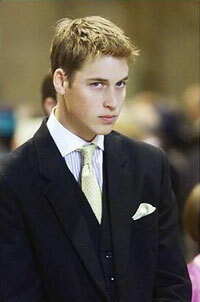 To go along with his good looks and good manners William also possesses a high level of intelligence. His intended major at St. Andrew�s University of Scotland, which he will not be attending until the fall of 2001, is Art History. For the next year, William will be traveling abroad in South America with a group of other students from around the world. Should Prince William ascend the throne one day, he will be called King William V, but meanwhile prefers to be addressed as William, not sir and is reportedly quite happy for the time being not to use his royal title HRH.